I was so excited to finish my DQS6 quilt today. 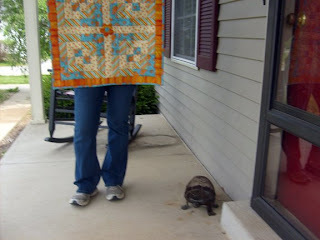 The icing on the cake was receiving my very own DQS6 quilt from Quiltinkimie. 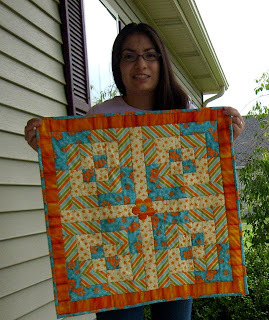 I have no idea what she had in mind for her first attempt but I love the fun cheery summer colors in this quilt! 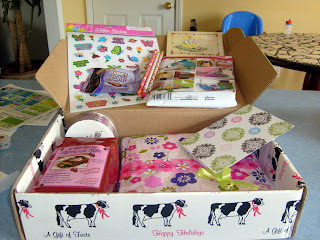 Here is the cute cow box I got in the mail today. It was packed with loads of goodies for me and my kiddos: chocolate, stickers, pencils, a pattern, a needle card, ribbon, a cranberry brownie mix (drooling just thinking about it!) and of course my Doll quilt! Over on our flickr group we were "challenged" to take a picture of ourselves with our quilt that we made and the one we received. Since hubby was not around I had "Big Brother" take my picture! Not bad for a 5 year old! Ok so there were quite a few frames he had to take before we got to an acceptable one! And Finally a picture of my completed DQS6: "Butterfly Beauty" Again, taken by my little guy! 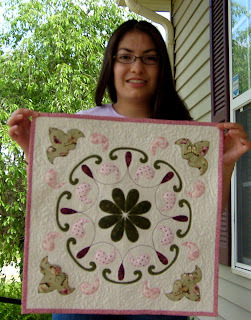 I love the doll quilt and saw it posted on Crafster. It's so beautiful.